Do you wake up in the morning with a tight, sore jaw and persistent headaches? You could be one of the millions of Americans who grind their teeth. Teeth grinding, medically known as bruxism, is a condition that affects approximately 10% of adults and 15% of children at any one time. Not only can bruxism have detrimental effects on the quality of your sleep, but it can also be problematic for the health and function of your teeth. Bruxism can lead to a variety of dental health issues, including gum recession and even tooth loss. Dr. Todd Casey at Casey Family and Cosmetic Dentistry in Oakton, VA offers night guard treatments that can protect your teeth from bruxism while you sleep. Bruxism is a condition that is characterized by the patient persistently clenching or grinding their teeth. In the majority of cases, the patient does this either subconsciously, or while they are asleep. If the patient grinds their teeth while sleeping, it most commonly occurs during the first part of the sleep cycle and before deep sleep is achieved. Depending on the severity of their bruxism, a patient may grind their teeth multiple times during the night. Sometimes a person may clench or grind their teeth while they are awake, normally as a result of being stressed and distracted. However, it is sleep bruxism that is the biggest contributor to dental damage and other unpleasant side effects. What happens when you grind your teeth? 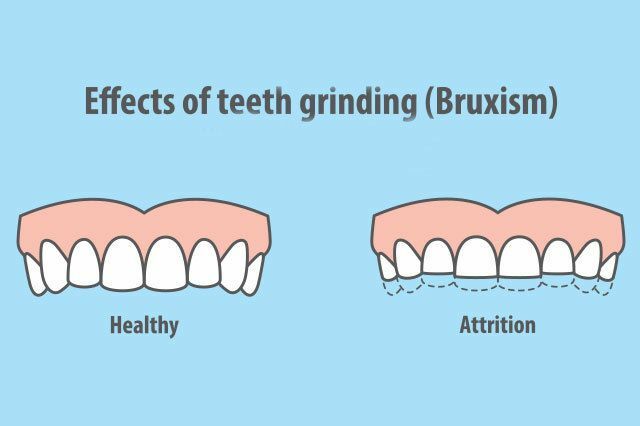 The biggest impact of teeth grinding is usually seen on the incisors and canines. This is because they are the first to come in contact with one another when you close your jaw, since the incisors are responsible for guiding your bite into the correct position. Grinding puts pressure on the enamel on the top of the teeth, causing it to wear down and become blunt. Sometimes, the top layer of the teeth wears away entirely, allowing bacteria to penetrate the tooth, causing decay. People who grind their teeth also find that they experience a range of other unpleasant symptoms. Stress and anxiety are believed to be the biggest contributor to the development of bruxism. Therefore, many experts believe that therapies to reduce these conditions can be beneficial in treating bruxism. Some of the suggested therapies include meditation, yoga, and counseling services. Some patients may also look into the possibility of anti-anxiety medications, if their anxiety is severely impacting their lives. However, treating stress and anxiety to eliminate bruxism can take some time, before it is successful. As such, many dentists recommend that patients who grind their teeth instead consider wearing a dental night guard. You can also try to refrain from bruxism inducing activities, like caffeine and alcoholic drinks, which are risk-factors of teeth grinding. Dental night guards are plastic coverings that sit over the top of your teeth, encasing them completely inside. When your teeth try to come into contact during an episode of grinding, they are protected by the plastic sheath, preventing damage from occurring. Although it is possible to buy dental night guards over the counter, we recommend that you arrange for a custom variety to be created. This is because each custom night guard is molded specifically to fit the shape, size and alignment of your teeth, ensuring it is a better and more comfortable fit. This will make it much easier to get used to wearing, helping you to get a better night’s sleep and reap the benefits of the night guard much sooner. Not to mention, custom night guards are much more durable and effective than over-the-counter varieties, and they can be used up to 10 years. If you are concerned that you or your partner may be suffering from bruxism, our experienced and knowledgeable team would be delighted to help you. Call our Oakton, VA dental office today to arrange an appointment at 703-997-1300.